Why a Statement on young children and digital technologies? 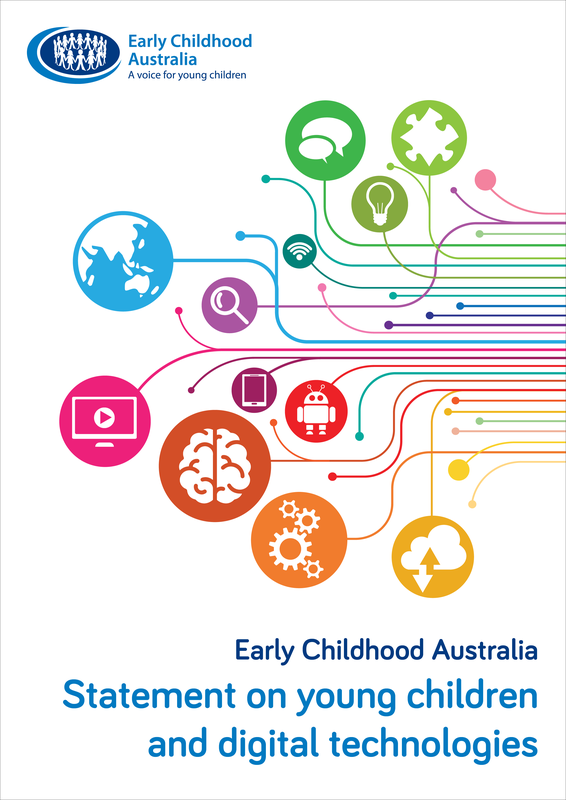 Early Childhood Australia launched the Statement on young children and digital technologies at the 2018 ECA National Conference. The Statement on young children and technologies supports the early childhood education and care sector, children, families, decision-makers and technology developers to understand technology use with and for young children. Instead of working towards ‘one-size-fits-all’ advice, a contextual approach recognises that educators are skilled at working in partnership with children and families and making decisions in the best interests of the child. Each area canvassed in this Statement is accompanied by a guiding principle and ‘practice advice’ intended to facilitate professional reflection on the role and optimal use of digital technologies with, by and for young children, according to the digital contexts in which young children, their families and educators play, live and work. You can download the full Statement on young children and digital technologies, and in addition, a summary version which captures the four guiding principles and the practice advice for early childhood educators (drawn directly from the Statement) can be found here. The ECA Statement on young children and digital technologies was developed in response to an identified need for guidance for early childhood professionals on the role and optimal use of digital technologies with, by and for young children in early childhood education and care settings. This need has grown as children are increasingly growing up in digital contexts. In June 2016 the ECA Board supported a recommendation from ECA’s Digital Business Kit (DBK) Reference Group that ECA should lead the development of a Statement on young children and digital technology for the Australian context. ECA established and worked in consultation with an advisory Digital Policy Group, which comprised representatives of 14 Australian-based organisations and academics with an interest and expertise in young children and digital technologies. The role of the Digital Policy Group was to provide independent advice and expert guidance to ECA on developing the Statement on young children and technologies on issues of young children’s education, development, health, wellbeing and safety, parenting, interactive technology, media and online environments, family and child research. The Digital Policy Group held its first meeting in September 2016. Dr Chip Donohue, an international keynote at ECA national conference in Darwin, October 2016, was an invited guest and shared his experience developing a similar Statement in the USA. Developed over a two year period, the Statement on young children and digital technologies is informed by sector consultation, published research and expert advice from within Australia and internationally. Extensive sector engagement included a national online survey (Zabatiero, Straker, Mantilla, Edwards & Danby, 2018), and social media participation. Children were also consulted on their perspectives about digital technologies in early childhood education and care settings. Expert advice was sought regarding young children and digital technologies in areas including health and wellbeing, ethics and citizenship, and digital media consumption. In addition, a critical review of specifically relevant literature was completed. Feedback from the early childhood sector on the Discussion Paper was incorporated into a Draft Statement, circulated to the ECA Digital Policy Group and further reviewed. The ECA Statement on young children and digital technologies was finalised in early September 2018 for launch at the ECA National Conference in Sydney on 21 September. Contact policy@earlychildhood.org.au to stay in touch with developments.